As with all water sports, beach sun protection from lengthy exposure to those golden rays is something to be taken seriously. It’s easy to lose track of time when enjoying every moment of your stand up paddle board cruise or surf. Don’t get burned; be protected! It’s not just about the burn, of course, it’s also the long-tern effects of over-exposure to the sun’s ultraviolet rays. Without protection from sun screen or clothing you run the risk of early dark spots, dry wrinkled skin, and skin cancer—melanoma. Even without a burn, continuous exposure to the sun is cumulative. The damage is done, and can’t be undone. 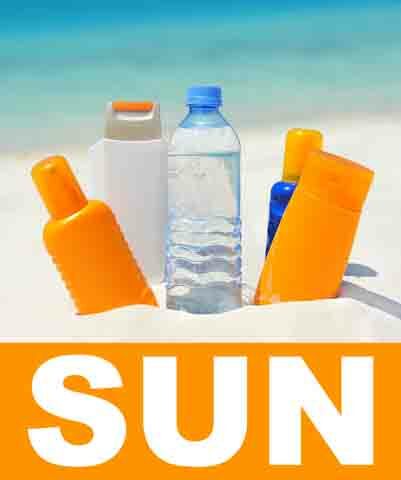 According to the American Melanoma.org, sunscreen contains chemicals that absorb ultraviolet radiation (UVR) to reduce the amount that reaches the skin. Some people are sensitive to sunscreens. Look for sunscreens that include Parsol 1789, which has been shown to be less irritating to sensitive skin. Sunblock contains ingredients that physically block the sun’s rays from reaching the skin. It’s often a thicker lotion than sunscreen, and may contain titanium dioxide or zinc oxide. Again, for people with sensitive skin this is often a preferred choice. It used to be that zinc oxide could only be applied in the form of an opaque white colour. Today with new grinding technologies both zinc and titanium sunblocks can be found that go on clear. Sunscreen and sunblock, when applied to the skin, absorbs or reflects a portion of the sun's UVR. Whether you choose lotion (cream or spray), gel, or other alternative topical product, the Canadian Cancer Society recommends a sun protection factor (SFP) of 30 or more if you plan to spend long periods in the sun. The bottom line? For sunscreen or sunblock to work, you have to apply it! also offered is a specific mix for children. Sun protective clothing with UV ratings are often called a "rash guard" in the context of surfing or SUP, is specifically designed for sun protection and is produced from a fabric rated for its ultraviolet protection factor (UPF). Most regular summer clothing has a UPF of 8 or less, so you do want to consider the protection you’re getting from your clothing just as you would from a sunscreen or sun block. Consider buying rash guard clothing designed for water sports with a high UPF: long sleeve and short sleeve shirts, tanks, swimsuits, shorts and pants. Remember, you’ll still need to apply sunblock or sunscreen to any exposed skin areas. The bonus with clothing designed for beach sun protection, of course, is that it won’t wash off! DESCRIPTION: Tips on sun screen from David Suzuki Foundation.. 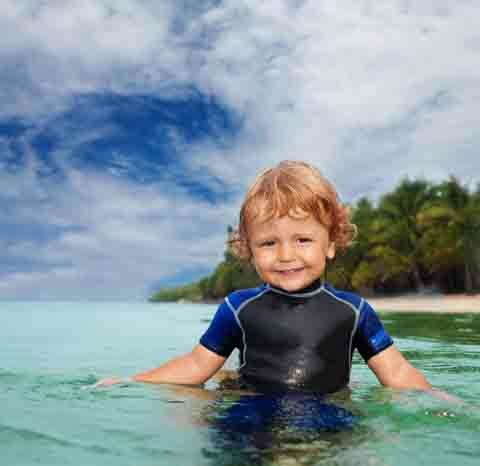 Rash guards with high UV protection ratings, are an easy solution for kids.